Vegas is a lot like an oversized sandbox. We’re a man-made, sandy playground for folks who just can’t seem to behave themselves. It’s not easy growing delicate little blossoms in this kind of environment so naturally, we do what we do best — tell Mother Nature to shove it and do whatever the hell we want. And when it comes to bringing flowery landscapes to all you bud lovers out there (not that kind of bud-at least not until it’s voted on in 2016), we’re more flamboyant than drag queens. 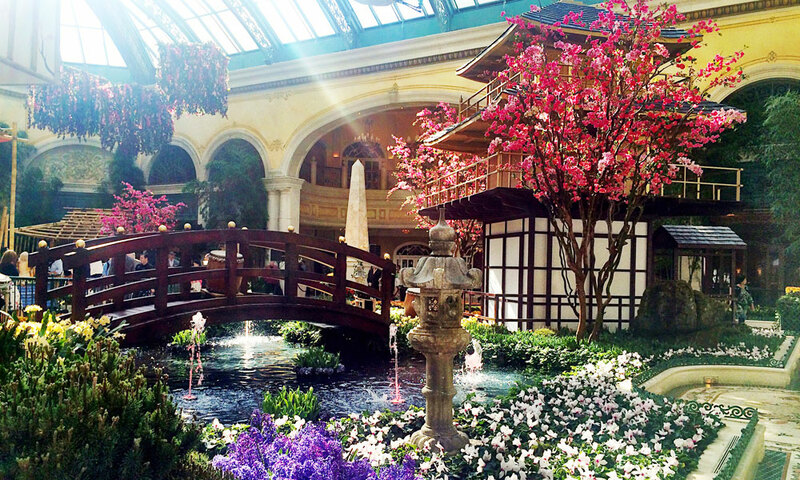 In honor of National Gardening Month, we’ve put together our top spots to see spring blooms in Vegas. OK, so this is really a no-brainer. 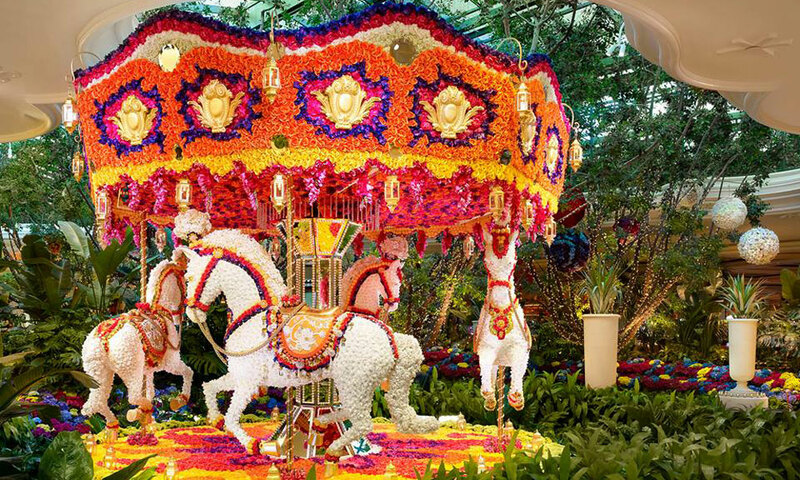 The Bellagio Conservatory is so popular that there have been 124 million visitors since it opened in 1998. This year’s spring exhibit is Japanese-inspired and includes a Shoji screened temple, a bamboo tea house, an 18-foot tall cherry blossom tree and raked sand gardens. There will be 82,830 flowers used, 16,000 pounds of pebbles in the flower beds and 21,000 gallons of water in the Koi pond. It takes a team of 120 staff working 24 hours a day and seven days a week to switch out the displays five times a year. We’re going to bet our lunch money that you probably haven’t seen a 700 pound butterfly with a 16-foot-wide wing span. 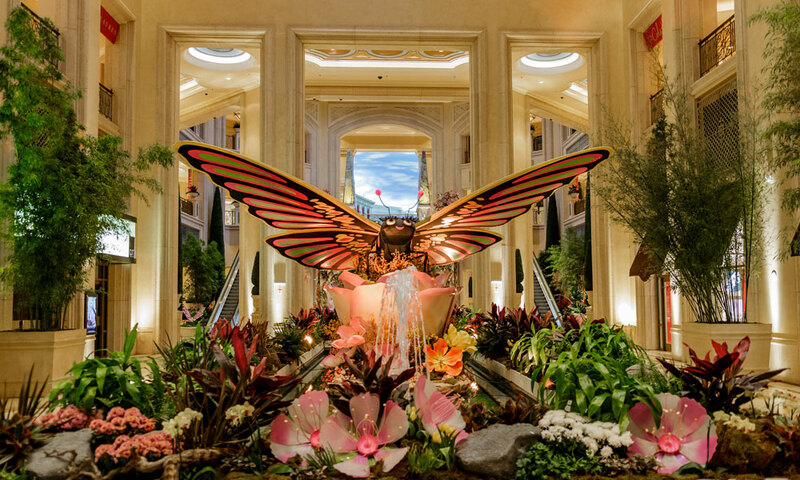 It took six months to design, engineer and construct Bella the butterfly for the Palazzo’s Waterfall Atrium and Gardens. She flutters her wings every five minutes and is surrounded by acrylic cherry blossoms that took six weeks to hand mold. There are nearly 2,000 flowers and plants in the new spring display, which isn’t a big deal when you have a water reclamation system that produces 20 million gallons of clean water for horticulture use a year. The Wynn never does anything half-way, so when they called on celebrity event planner and floral mega-giant Preston Bailey, we expected nothing shy of extravagant. And boy, did he deliver. Bailey drew from whimsical childhood memories to create the 20-foot-tall hot air balloon and a 6,000 pound working carousel. The installations, which get replenished about every three weeks, required 110,000 flowers and join an elaborate walkway of 50-year-old ficus trees and countless hanging topiaries. In honor of spring, nearly 60,000 begonias, geraniums, chrysanthemums and petunias have been added to the hotel’s decor. We’ve hit the sweet spot for flower gazing at the Springs Preserve Botanical Gardens. April marks peak season for the blooming native Mojave and desert-adapted plants. These are the Chuck Norris version of plant life, needing very little to survive. They are so resilient because of adapted water storage techniques like smaller leaves and deeper root systems to reach underground water supplies. 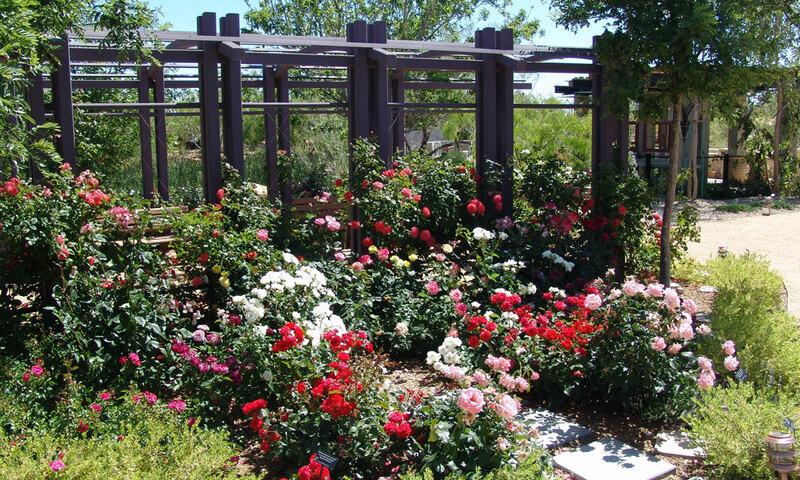 While you’re there, check out the rose garden that features more than 60 different varieties and the Butterfly Habitat. A botanical desert may sound like an oxymoron, but that’s exactly what you’ll find at Ethel M in Henderson. The largest cactus display in Nevada, this is probably closer to what you’d expect to see in the desert. 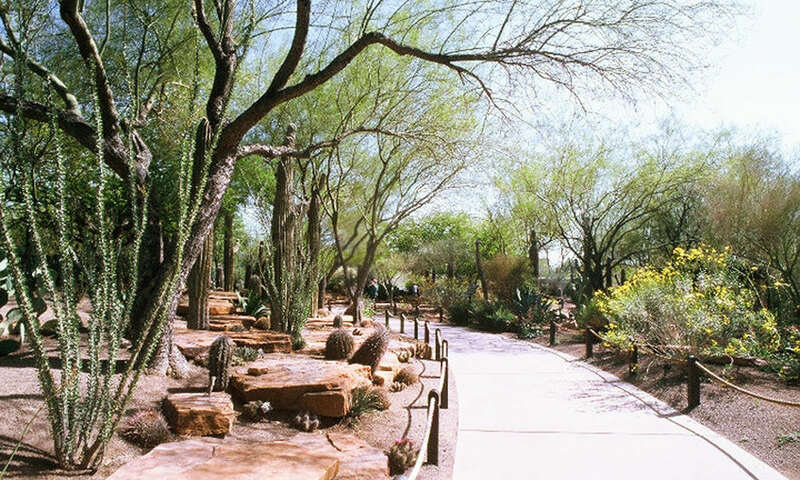 More than 300 species of plants make up the four acre garden and include cacti, succulents and other drought-tolerant ornamentals native to the southwest, Australia and South America. For all you daredevils (AKA boneheads) out there, take it from us and DON’T TOUCH ANYTHING. It’s true, there really are desert flowers. Where did you think Sting got his inspiration from anyway? Wait – that song may have actually been about a chick. Anyway, there are plenty of places to see cactus and other wildflowers bloom if you get there at the right time, which can be tricky depending on rain and how quickly it heats up. 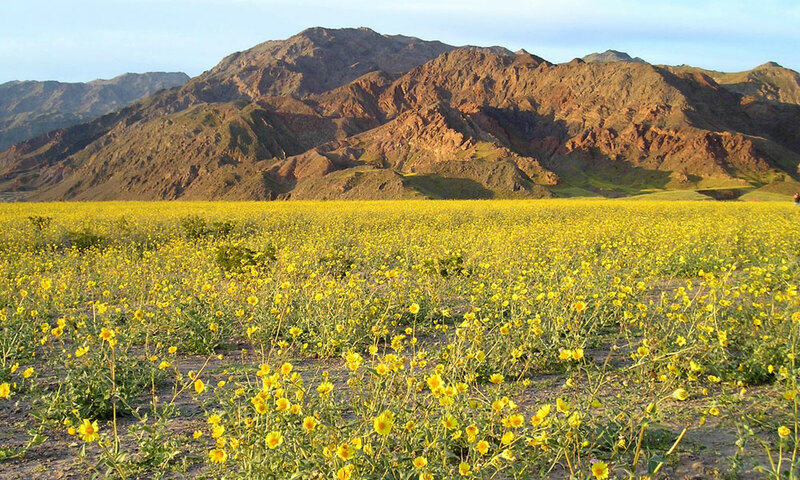 Tours of Death Valley, Red Rock Canyon and Lake Mead are great places to see them in their natural state.